I love this Tom the Dancing Bug comic. It's funny; funny in the sense that if I didn't laugh, I'd cry, I suppose. 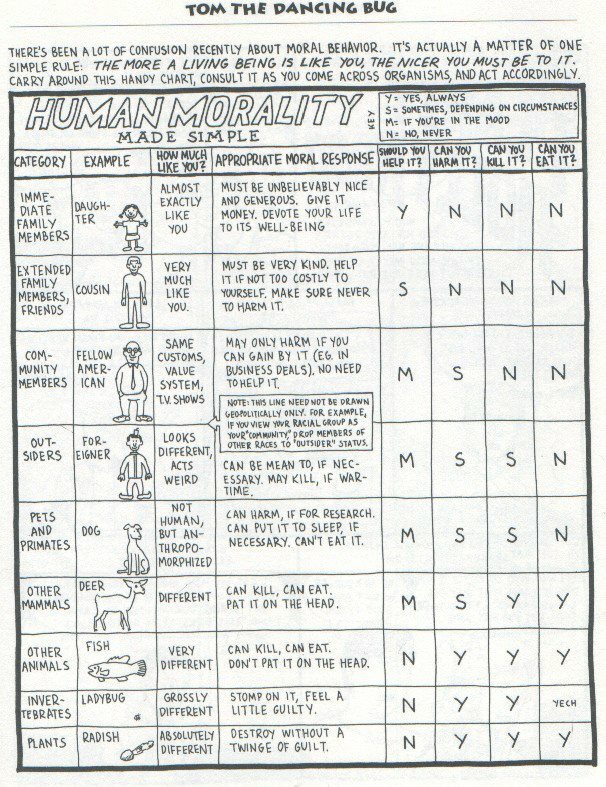 The graphic isn't really a morality guide, as many of you already fully appreciate. It's a behavior map most of us follow naturally, courtesy of our genes. Which isn't morality; it's our pre-programmed baseline. Moral acts occur when we choose to act differently than our DNA prompts, by expanding a "Who We Are Nice To" category. If you're curious about my reasoning, read on. However, just to forewarn you, I fall back on a few SAT words. All that said, none of us decide how we'll act in a vacuum. The culture in which we are raised is bursting with ideas on ways to behave. However, you can look at them through the filter of ideas that cajole us to broaden these categories, and through a filter that that demand that we keep to category baseline, or even push outsiders into a lower category. You've heard of the Golden Rule, most likely, which is a major driver of category expansion. Many religions teach some form of this. However, you've probably run up against various "fear the foreigner" meme, which drives category contraction. Anyway, you've probably incorporated some of these category expansion ideals into your own behavior. Whenever you act according to the Golden Rule in a category outside what your genes demand of you, you're making a moral act. By my lights, it doesn't matter whether you chose to act this way or your culture inculcated you to act differently and more benevolently--that's the benefit of living within an evolving culture! On the other hand, and again by my lights, if you've inculcated less benevolent memes, that's an immoral choice, regardless of what your culture expects. "When in Rome," or "just following orders" doesn't cut it, when you're defining morality. Otherwise, I agree with Tom the Dancing Bug, broadly speaking, being "nice" is being moral, but only if you've somehow broadened your "Who You're Nice To" category beyond what brute instinct would have you act to preserve your own kin and kind.